Free Download MegaFooty Quick Kick Apk For Android From RevDl.com. MegaFooty brings all the action of Aussie Rules Football to your Android device. As played in the AFL, VFL, SANFL and WAFL leagues in Australia, Australian Rules Football is a fast paced sport requiring quick thinking and even quicker ball skills. 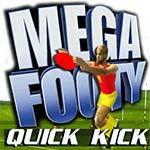 Best played on tablets or larger screens MegaFooty is a simple to use 3D version of Australia’s favourite sport. – Play teams of up to 12 players a side and 4 minutes per quarter. – Edit the home team to make your own club and players. – Learn the basics of controlling your players in Boot Camp mode. – Practice passing the ball in Team Training mode. Modify / Delete contents of USB or SD card. – for saving teams and players. Prevent Tablet from sleeping. – stop device from going to sleep during autoplay mode. Test access to protected storage. – finding device’s preferred storage location.